How Do I Choose the Best Face Scrub for Men? A face scrub should be gentle on the skin. Scrubs should be suited to a person's specific skin type. You can choose the best face scrub for men by selecting a product gentle on skin, low on fragrance, and lacking in potentially harmful ingredients. Harsh beauty products often do more harm than good, so make sure the product does not feel too abrasive. If possible, get an unscented product to avoid potential allergens and irritating your eyes during the application. In addition, it is possible to make a homemade scrub from kitchen ingredients, which is sometimes preferable to save money or ensure the ingredients are all natural. Choose a face scrub for men that is gentle on your skin. 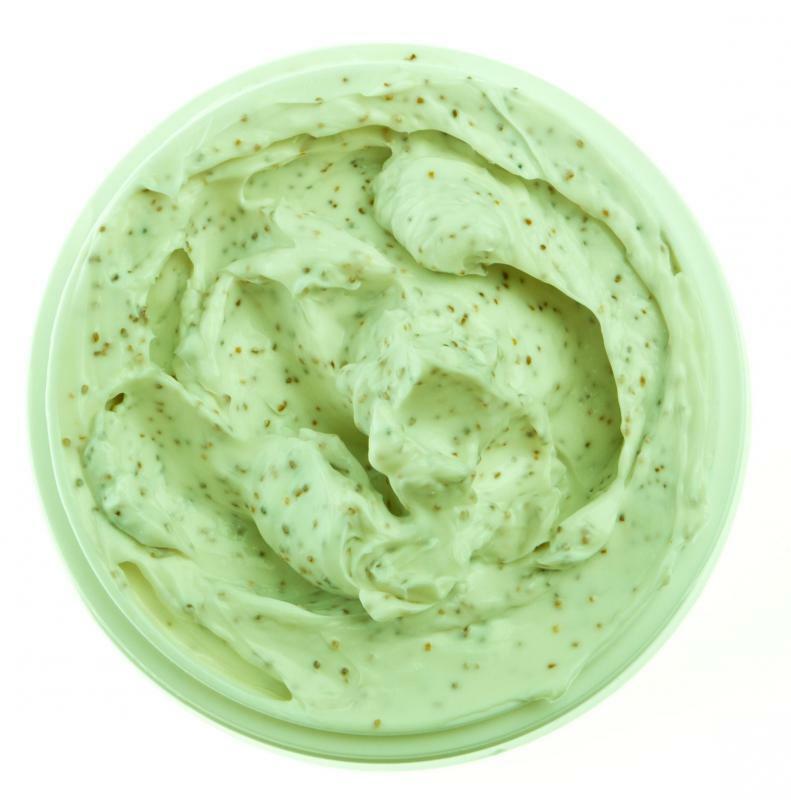 Some facial scrubs are too abrasive and can actually damage skin rather than simply remove dead skin. When you rub the scrub between your fingers, it should have either a smooth or very fine but grainy feel. If it hurts to gently rub the scrub into your face, it is too abrasive and not a product you should use on a regular basis. Do make sure you are not rubbing too roughly, however; it is easy to overdo a facial cleansing, but the truth is very little effort is needed to rub away dead skin cells. A face scrub for men does not necessarily have to be produced by an expensive brand. What matters in a face scrub is its ingredients. For example, if a face scrub is scented, it may have chemicals that potentially irritate the skin. Furthermore, a scrub that lathers heavily or has certain ingredients such as sodium lauryl sulfate can also irritate sensitive skin. Not all skin is the same; take into account how sensitive your skin is and if you have any allergies when shopping for a face scrub. When choosing a face scrub, it is important not to have unreasonable expectations. Some advertisers may falsely claim that a certain scrub will help reverse the effects of aging, for example. Other products may claim to be exceptional due to natural ingredients that do not necessarily help skin. The key factor to consider while considering face scrubs should be their ingredients, not the brand or advertisement claims. If you are short on money or time, consider making a homemade face scrub for men. There are thousands of combinations; for example, a lot of recipes call for honey, sugar, or oatmeal. Experiment to find out what works best on your skin. The advantage to this method is that you have complete control over the ingredients and can avoid allergens and unnatural ingredients. What Are the Benefits of a Honey Face Scrub? What are the Different Types of Facial Mask? What are the Different Types of Citrus Facial Scrubs? What are Some Uses for Noxzema&Reg;? What kind of exfoliant do you guys prefer in a scrub? I use a scrub that has cornmeal in it and I don't think it exfoliates too well. I'm thinking about trying a scrub with sea salt or ground nut shells. I think these might exfoliate better. Has anyone used a face scrub with one of these ingredients? Would you recommend it? @literally45-- I'm very sensitive to scents too but sometimes I don't even like the scents of men face scrubs. To make a scrub smell "manly," some brands put way too much perfume in them. I prefer hypoallergenic face products without a scent. Those never irritate my skin. My brother has rosacea and this is the only type of scrub he can use as well. I look for two things in an exfoliating face scrub -- a tolerable scent and no residue. I don't mind scent in a face scrub, but it should be mild and nothing girly. I hate it when a face scrub smells like flowers. I also hate it when my face scrub leaves a filmy residue on my face afterward. I want my face to feel clean and fresh. I use a face scrub regularly. If I don't, I get ingrown hairs after shaving. Right now, I'm using one from the pharmacy that's formulated for both men and women. It has a nice fresh scent and my face feels very clean after I use it. I like it a lot.